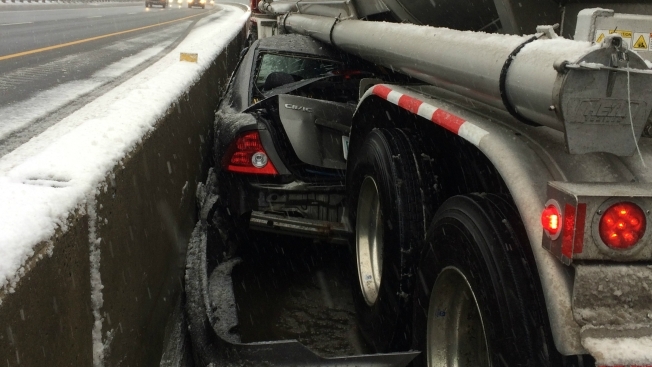 A New Hampshire man is lucky to be alive after his car was pinned almost entirely underneath a tanker truck following a crash on Wednesday. New Hampshire State Police said they responded to a report of a motor vehicle accident on Route 101 east in Hampton shortly after 2 p.m. Police said a 2004 Honda Civic was traveling eastbound on Route 101 in the left lane when the driver lost control and slid into the tanker portion of a 1999 Peterbilt tractor-tanker combination that was in the right lane. Both vehicles then slid into the concrete jersey barrier on the left side of the highway, pinning the Honda underneath the tanker and against the barrier. The Honda's driver, 34-year-old Daniel Decoteau of Milford, escaped unharmed. He was able to climb out of his vehicle through the passenger window and then underneath the tanker. The driver of the truck, Aquiles Martinez, 53, of Somerville, Massachusetts, suffered minor injuries and was taken to Exeter Hospital for treatment. The accident remains under investigation, but police said it appears excessive speed during the icy weather may have been a contributing factor. The left lane of Route 101 was closed for over an hour as the vehicles were separated and removed from the roadway.